Established in January of 1991 by sisters Ann and Karen Mitchell, AnKara Designs specializes in elegant and feminine handcrafted costume jewelry and accessories. Utilizing original sculpting techniques of polymer clay combined with crystal and pearl beads, metal filigree, and antique glass cabochons, the sisters create wearable art in a vast array of styles ranging from vintage designs to an updated classic look. Ann Mitchell received her B.A. in Business/Marketing from the University of Oregon. She also pursued her own artistic endeavors through classes in ceramics and watercolor painting. After college, Ann worked for several years as a bank manager before deciding to start her own company. Even while in banking, she was interested in art, studying at Pasadena City College. After two years at UCLA, Karen Mitchell transferred to the Fashion Institute of Design and Merchandising, where she spent another three years studying fashion design and theatre costume design. The exclusive costuming program presented her with the opportunity to participate in an internship at Center Theatre Group. While at CTG, Karen worked on costumes and accessories for productions such as Phantom of the Opera and "Tremors." Following graduation, she decided to leave her position in retail clothing store management to work as a freelance wardrobe stylist. Karen split her time between industrial training videos, print ads, catalogues, and feature films. Several of the films she worked on include "Barton Fink", "Waxworks II", and "Kuffs." Working together, Ann and Karen share ideas to give their accessories the distinctive AnKara look. To further their knowledge about jewelry, they have studied metalsmithing. Their accessories have been seen on “All My Children”, “Ink”, and “You Wish” and have been featured in the films “Forever Love” and “Innocent Obsession”, the Disney production “The Haunted Mansion” (starring Eddie Murphy and Jennifer Tilly, November 2003), the independent film “Red Zone” (December 2002, starring Freddy Rodriguez), plus the films “Voodoo Moon” (2005, starring Eric Mabius and Charisma Carpenter), “Killer Pad” (2006- directed by Robert Englund) and theatrical productions King of the City: An Evening With Al Capone, The Gondolier, and Peter Pan. Their designs have also appeared on “ Live with Regis” and numerous morning news programs throughout the United States. Ann and Karen have developed innovative projects in liquid polymer clay, demonstrating these on the Carol Duvall Show (20 episodes) on the Home and Garden Television network and “DIY Jewelry Making” (7 episodes) and “Craft Lab” (2 episodes) on the Do-It-Yourself network. They have written projects and tips on polymer clay for the Staedtler, AMACO, Polyform Products, Michael’s, JoAnn Fabric and Crafts web sites. The sisters also have written a monthly column for the online magazine “The Bead Bugle” titled “Adventures with Polymer Clay” that discussed polymer clay as it related to beading and jewelry. Their work and original jewelry projects appear regularly in The Polymer Arts, Bead and Button, PolymerCafe, Bead Design Studio (formerly Bead Unique), Belle Armoire Jewelry, Just Steampunk 1&2, Jewelry Crafts, and Expression magazines. Several AnKara Designs pieces can be seen in three of Barbara McGuire’s books, Foundations in Polymer Clay Design, Wire in Design, and Creative Stamping in Polymer Clay. Several gallery pieces also appear in a book titled 400 Polymer Clay Designs: A Collection of Dynamic and Colorful Contemporary Work, edited by Suzanne Tourtillot, as well as several other books. For the National Polymer Clay conference at Arrowmont (Gatlinburg, Tennessee) in 1997, Karen used her costuming knowledge to create a reversible vest completely constructed of polymer clay pieces. Since then, the vest, along with several other accessories created by both Ann and Karen, have been featured in an exhibition titled “Incredible Clay: Feats of Polymer” at the Bead Museum in Glendale, Arizona, and another exhibition titled “Illuminating a Medium: A Retrospective on Polymer Clay” at the 2001 National Polymer Clay Guild conference called ‘Courting the Muse’ in Bryn Mawr, Pennsylvania. Their designs have also appeared in several national advertisements for AMACO and Polyform Products. 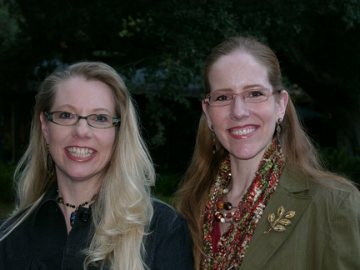 Ann and Karen were selected to teach at the ‘Courting the Muse’ Conference (2001) as well as the Ravensdale Polymer Clay Conference (2003, 2006) and the Synergy Conference (2008). Their classes focus on their diverse liquid polymer clay applications and jewelry design. Ann and Karen authored the only comprehensive book on liquid clay titled Liquid Polymer Clay: Fabulous New Techniques for Making Jewelry and Home Accents, from Krause Publications (June 2003). Their second collaborative effort is titled Bead Jewelry 101 published by Creative Publishing International (July 2009, second edition with DVD- 2011). The sisters continue to teach their mixed media concepts locally at their studio and at other venues and conferences. Karen and Ann participate in 18 arts and crafts shows per year marketing their distinctive line of jewelry, as well as offering services at their studio to custom design pieces for weddings, special occasions, theatre, film, television, and everyday wear. The AnKara Designs line is constantly expanding and evolving to stay current with changing styles.